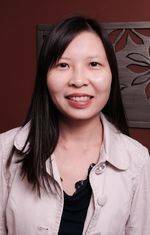 Dr. Wong is a licensed optometrist and she received her Bachelor of Science and Doctor of Optometry degrees from the University of Waterloo in 1998. Her training includes the completion of an Ocular Health and Therapeutics internship at the Eye Foundation of Utah. Since graduation, she has had the opportunity to work in several optometric practices in Scarborough, Don Mills and Newmarket prior to opening her own clinic in Aurora in March 2006. When away from the office, Dr. Wong enjoys cooking, baking, knitting, and spending time with her wonderful husband and 2 beautiful children. As a family, they attend Cornerstone Christian Community Church in Markham. Dr. Myrna Wong is a member of the College of Optometrists of Ontario, the Ontario Association of Optometrists, and the Canadian Association of Optometrists.